Fifth time’s a charm? Georgia State fans and college basketball historians hope so. It’s alarming in their eyes that a certain Panther’s name doesn’t sit inside the Naismith Memorial Basketball Hall of Fame after already being on the ballot four times. Former head coach Charles “Lefty” Driesell’s accolades include a 786-394 record, 16 regular season conference championships, six conference tournament championships, eight top-10 finishes, 13 NCAA Tournament appearances and four Elite 8 appearances. When Driesell retired in 2003, he was the fourth-winningest coach in Division I college basketball. The three ahead of him, Bob Knight, Adolph Rupp and Dean Smith— were all enshrined while active. “I don’t want to get into any comparisons, but I think I’m in pretty good shape this year,” a chuckling Driesell said. He was the first coach to win 100 games at four different schools. Whatever the shape the programs were in doing prior to Driesell arriving (a combined five NCAA Tournament appearances), he left them in better places. He won 176 games at Davidson, 348 at Maryland, 159 at James Madison and 103 at Georgia State. This time around he’s the only college coach on the ballot. First-time finalists who he is up against this year include Ray Allen, Jason Kidd, Steve Nash, Katie Smith and Tina Thompson. However, the hall doesn’t have a cap on how many people can be selected. So, in theory, all 13 finalists could be inducted. Driesell was inducted into the College Basketball Hall of Fame in 2007, its second year in business. 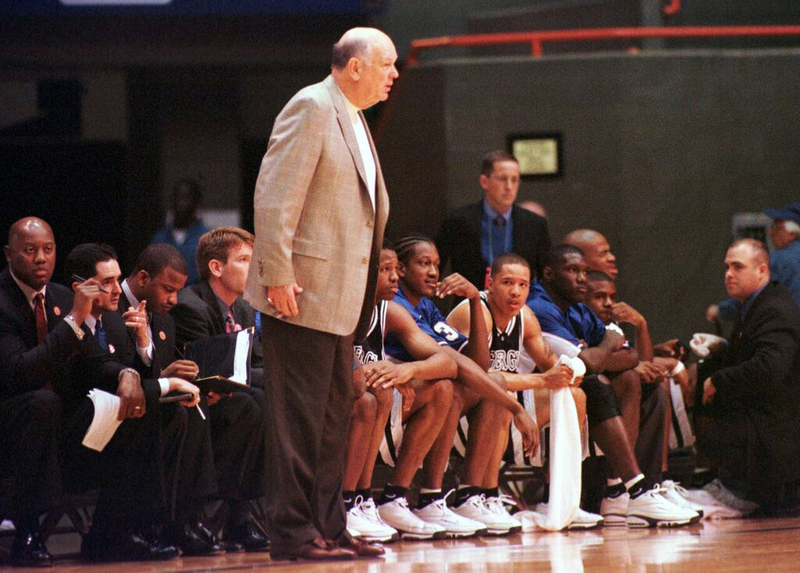 His biggest moment at Georgia State was winning the Atlantic Sun tournament championship in 2001 and advancing to the second round of the NCAA Tournament. Maryland was where Driesell earned his notoriety and what gives him the most consideration for a spot in the hall. “[The game was] no different, you just want to win, whoever you play. But I certainly wasn’t pulling for Maryland,” Driesell said. The 29 wins he and the Panthers won in 2001 were the most he won in a single season. Georgia State had just one NCAA Tournament prior to Driesell, but they’ve had two since. In earlier days of college athletics, recruiting was considerably less challenging than in his six-year Georgia State career. However, Driesell’s run at Georgia State shows that he can coach with today’s restrictions. “Back then, you could recruit 12 months out of the year, 24 hours a day. So now you’ve got all these restrictions, you can’t do this, you can’t do that. It made it easier,” Driesell said. For every knock on Driesell’s resume, a counterargument exists. He coached a great deal when there weren’t recruiting restrictions, but so did the other greats who were elected. He never won a national title, but neither Pete Carril and John Chaney. He’s 12th in all-time wins, but the 12th leading scorer in NBA history is in the hall. As Driesell is more removed from his coaching career with every year, the risk grows that his accomplishments will be looked upon as just numbers. Making winners out of programs that had relatively little success is a tough task. It may be undervalued by the voting committee in favor of other candidates solely because of recency. A constant throughout the 41 teams Driesell coached was good defense, what he calls a must to be successful. He ran a man-to-man defense, but thinks good players are the backbone of a great program. “We had good players, we worked hard, and played together, we played good defense. We didn’t take bad shots,” Driesell said. “I’m really honored that my name is on the court at Georgia State. That means a great deal to me,” Driesell said. He probably would never say it, but it could mean a greater deal if 16 members of the 24-member committee believes Driesell is honorable enough for enshrinement. The hall reveals the Class of 2018 on Wenesday, March 28 before the 2018 Final Four. The enshrinement ceremony is set for Sept. 7 at the Naismith Memorial Basketball Hall of Fame in Springfield, Massachusetts.